The Brown Marmorated Stink Bug (Halymorpha halys) is a pest of primarily fruit trees, but also numerous fruit and vegetable crops including corn. Surveys were conducted because the presence of potential host material in Wyoming and the high potential for establishment after introduction. It has become established in the eastern United States, and has been reported in Oregon and Colorado. The Brown Marmorated Stink Bug portion of the Small Grains Commodity Survey is conducted by the Wyoming Pest Detection / CAPS Program. and is a visual examination of the host plant. Host plant fields were swept with nets and visually surveyed June through August. Sweep net samples were examined for suspects at the University of Wyoming. Seventy-nine fields have been surveyed and visually examined in seven Wyoming counties. 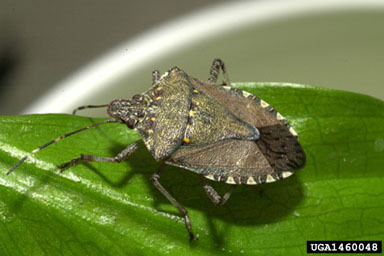 The Brown Marmorated Stink Bug has not been found in Wyoming.